In light of Stamp Week I was tooling around on Facebook and came across a great Facebook Shop Page for Homemade Cards, Bookmarks and other great items. Seeing how this is about as far as I have dipped my toes into the stamping world. I was truly amazed with this young girls talent. Kayla is just starting out into the blogging world and I wanted to give her a shout out. She is one of our local crafters and I always try to give our local community some much needed love. If you get a chance go on and check out everything that Kayla has to offer. You can find her stuff for sale on Facebook and you can get there by clicking on her logo or by clicking here. 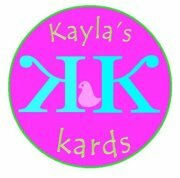 You can also check out her blog page here at http://kaylas-kreations.blogspot.com/. Here are some other cool items she has in her shop. You all know I have a soft spot for owls. Ha Ha! Remember we have a Mystery Stamp Giveaway (Valued at $25.00) going on here this week. Click here or on the Giveaway Button found on the sidebar to get the details on how to enter.